Among its many talents, the iPhone excels at giving you ways to pass the time. This is particularly true if you’ve got small kids to entertain. Should you find yourself standing in a long line or on a long car trip, fire up the iPhone, launch one the many simple low-cost or no-cost apps and hand the device over to a kid—now they’ve got something with which to occupy themselves. JellyCar from Walaber is a perfect example of one of those no-cost ways to pass the idle hours. Because it’s both fun and quite simple to get the hang of, this side-scrolling game is an ideal way to keep kids occupied. 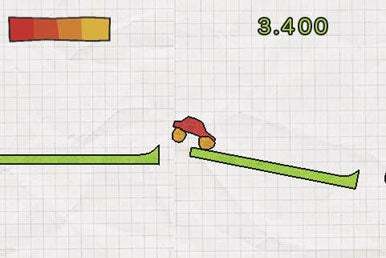 Like A Bowlful of Jelly: Navigate a car made of gelatin from Point A to Point B in the simple-yet-fun JellyCar. You’re in charge of a red car made of gelatin. Your object: navigate the car to the target at the end of the level while avoid the assorted obstacles that block your path. Like the concept itself, the controls of the game are pretty simple. Keep your finger on the right side of the screen to go forward and the left part to go backward. You can also transform your little car into a “monster truck” of gelatin for a few seconds by tapping on the car, and then tapping it again to change back. The game also incorporates the accelerometer; if you get stuck, you can tilt your iPhone or iPod touch back and forth to free yourself. The in-game menu is almost a game in itself. You can move the icons (which act like jello-cubes) for each individual level around the screen by tilting the device. There are three sets of levels-easy, medium, and hard—meaning you might want to take a spin with JellyCar after the kids have had their fill. JellyCar is compatible with any iPhone or iPod touch running the iPhone 2.1 software update.